Smoking inside is permitted by half of all homes with a smoker, even more in lower income households. Living with smokers increases nonsmokers' chances of developing lung cancer by 20 to 30 percent. * But smoking inside is permitted by half of all homes with a smoker, even more in lower income households. 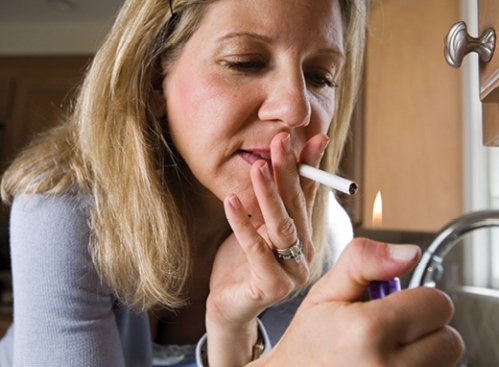 A National Cancer Institute-funded study headed by Rollins School of Public Health's Michelle Kegler suggests most of those households are receptive to going smoke free and, with some simple help, can succeed. In the summer of 2013, more than 4,000 callers to the United Way of Greater Atlanta's 211 call center were directed to the help they requested and were then asked a smoking-related question: did anyone regularly light up in the house? If yes, would they like to participate in a program to help them make their home smoke free? Eighty percent jumped at the chance. Three months later, 30.4 percent of those given materials and a coaching phone call from Emory Prevention Research Center staffers had earned their "smoke-free home" window sticker. Like New Years' resolutions, behavioral changes often fade away. This one strengthened. After six months, the number of smoke-free homes had climbed to 40 percent. As is standard in research determining intervention efficacy, half of participants received no materials or coaching, only 30-minute phone calls collecting data on secondhand smoke exposure in their houses. These phone calls alone were enough to nudge 14.9 percent of households to go smoke free at three months, rising to 25.4 percent by six months. Emory's research partners at the University of North Carolina and University of Texas-Houston are now testing the intervention, using 211 agents instead of university staffers. If it works as well in their communities as in Atlanta, Washington University in St. Louis will expand the grant nationally in collaboration with Emory and other partners. *According to the US Surgeon General, www.cancer.gov/cancertopics/factsheet/Tobacco/ETS#r4, which in turn references U.S. Department of Health and Human Services, "The Health Consequences of Involuntary Exposure to Tobacco Smoke: A Report of the Surgeon General." Rockville, MD: U.S. Department of Health and Human Services, Centers for Disease Control and Prevention, Coordinating Center for Health Promotion, National Center for Chronic Disease Prevention and Health Promotion, Office on Smoking and Health, 2006.